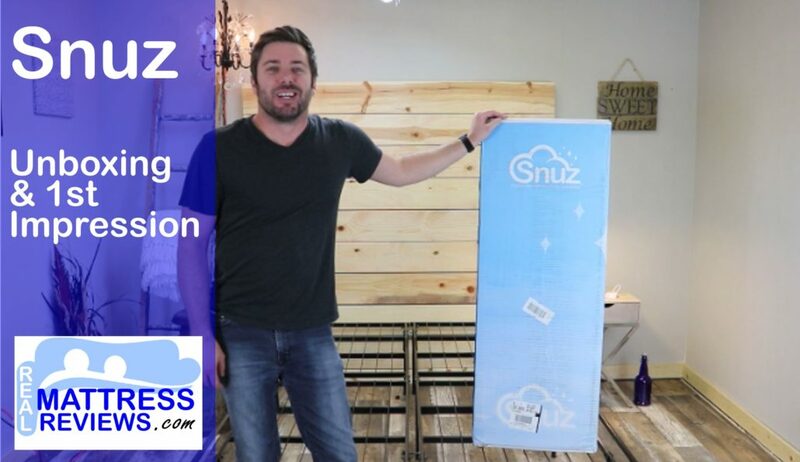 Snuz Mattress Review l Snuz Bed Reviews | Best for Pressure Relief? Snuz is designed with pressure relief in mind. Utilizing channels cut into the foam for problem areas like shoulders and hips Snuz will work great for side sleepers. The Snuz is a 3 layer mattress. This mattress uses channels in the hip and side area in the top layer of foam to provide extra pressure relief in those problem areas. The overall feel of the mattress is nice. It’s suited very well for side sleepers. Like a memory foam feel without a stuck feeling – Snuz has a rather fast reacting top layer making it easy to move around and not giving you a stuck feeling. Like a good combination of body conformance paired with bounce – Snuz has good body conformance without being overwhelming and maintains good bounce for a memory foam mattress. Are a side sleeper – Snuz is a solid option for side sleepers. Even lighter side sleepers will sink into the foam and be supported nicely. Value great motion reduction – Does you partner move around a lot? Snuz will help minimize motion transfer so you will not feel movement from another person. Want a memory foam feel and sleep hot – For us Snuz had no issues over heating. The charcoal infused memory foam disperses heat much better than old school traditional memory foam. I think the channels will also provide additional airflow. Weigh 250lbs-280lbs or more – Although when you weight is dispersed you won’t have an issue bottoming out I feel a heavier sleeper may not get a long lifespan out of the Snuz. Like more of a latex feel or a lot of bounce – Snuz has a good amount of bounce on top but latex will be springier. Want extra strong edge support – Snuz had no issues when in the sleeping position but if you value very strong edge support for sleeping and sitting down you will want to consider something else. The Snuz cover is removable and washable. It is also stretchy and stays tight on the mattress. The clouds on the cover are a nice touch too, even though they get covered up! The Snuz will work great on any solid surface. The floor, platform slats, boxspring/foundation and they now offer an adjustable base as well. Snuz is a good choice for those looking for pressure relief. The Snuz Mattress impressed me for the following reasons. A.) The feel of Snuz is great for side sleepers. B.) The foam provides good pressure relief. C.) It worked well in all sleeping positions. Especially side sleeping. D.) It has a good medium-soft feel that will appeal to most of you out there. E.) I like that it has a good body conformance while still maintaining good bounce and allows movement without a stuck feeling. One immediate con would be that the foam core is not super dense, this is why I don’t recommend Snuz to heavier people 280lbs or more. I thought the Snuz felt great. As Ross said in the review that Snuz works well for lighter sleepers who still want good body conformance and pressure relief. It provided great pressure relief for me even being lighter. The channels cut into the foam I believe certainly help with this area. For me being lighter sometimes on a mattress Ross calls soft I would call medium because I don’t sink in as far, so I like that aspect of the Snuz. The overall feel is a good medium-soft that most of you will like, it slept cool and performs great in all 3 sleeping positions, especially on your side. Snuz uses a high performance poly on top. Poly does not trap heat much at all. Under that is a charcoal infused memory foam that is formulated to sleep cooler than regular memory foam. The channels allow for some airflow as well. Although there’s a decent amount of sinkage it does not sleep very hot. Although we didn’t film the Snuz on a base you can be sure it will work fantastic on an adjustable base. Snuz is a new brand that has design features others don’t, like the zones and channels designed for pressure relief. 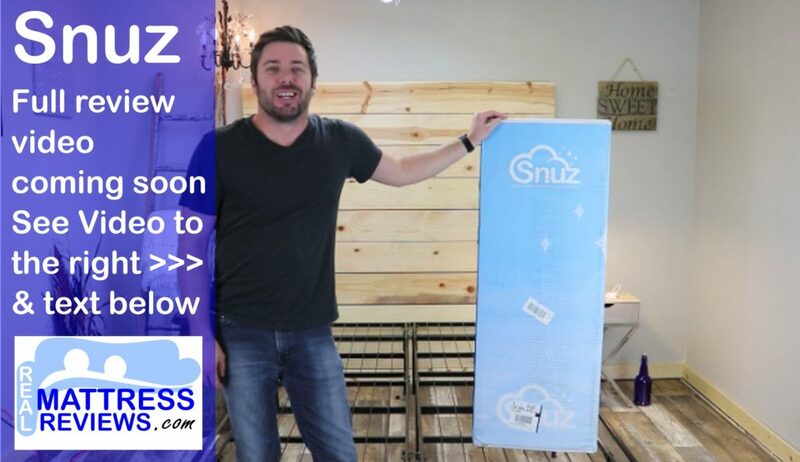 The Snuz mattress is determined on getting you better sleep by focusing on the 7 zones of your body for optimal ergonomic support and pressure relief. This mattress is a 10″ three layer mattress that combines a layer of zoned polymer with a layer charcoal infused memory foam. These comfort foams sit on a dense base foam to create a solid, durable foam bed that should lead to a great night sleep. It is also covered in a zippered cover that is designed with added cooling materials as well as anti-dust mite properties. Consider Snuz if you seek good pressure relief.